I’m Back! Now Where Was I? Oh. My. Lord. What a slacker I have been! My poor blog has been so neglected! Blame it on being too busy, blame it on being lazy, blame it on whatever you want – the fact of the matter is I haven’t been good about blogging and for that I apologize! Time to get back into the swing of things! So where have I been you ask? Oye, what a whirlwind the past couple months have been! As I mentioned, Matt and I were living with my sister, but we have since moved into a townhouse of our own that we absolutely adore! It is about 15 minutes away from work for both of us, so that is perfect! “Wait, work for both of us you say?” Yep, that’s right. I am now gainfully employed! After about a year of being a stay-at-home puppy mom, I figured I should probably find a job. I ended up getting a job at a hospital in the area in the imaging department (x-rays, CT scans, ultrasounds, MRIs, etc.). Long story short, I schedule exams for patients and doctors offices. It has been a LOT to learn, but I’m starting to feel like I am getting the hang of things. This partially explains my lack of blogging – I just don’t seem to have the time during the week, and on the weekends, I’m catching up on housework that I don’t have time for during the week. Now that the holidays are here, I will be cooking more and starting on my food gifts, so there will be more blogging! No more of these long hiatuses (if that’s a word)! So now let’s get back to the food! Turkey leftovers are everyone’s nemesis. Don’t even try to deny it – you cook that big ol’ bird and look at the leftovers and the carcass with all its yummy scraps and think ‘now what the heck am I supposed to do with all of this?!’. Soup, silly! Make soup! That is the quickest way to get rid of 90% of it (but save some for sandwiches of course!). I received this recipe last year from one of Matt’s former coworkers after she brought a big pot of it in and Matt raved about it. When he tried it, it had ham in it, but I thought I’d give it a whirl with leftover turkey. It is the BEST! Be warned, it makes a ton of soup, so plan on freezing a big container of it. Saute the onion, carrot, celery, & turkey in butter for about 5 minutes until the onions are translucent. Stir in the flour and continually mix so it doesn’t burn. Slowly add in the chicken broth and keep stirring to keep the flour from clumping. Add the cooked rice, and heat to a boil to thicken. Simmer for 10 minutes to warm through and add the half & half just before serving. Don’t let it come to a boil after you add the half & half. Serve with some warm bread and enjoy! This soup is your classic comfort food. 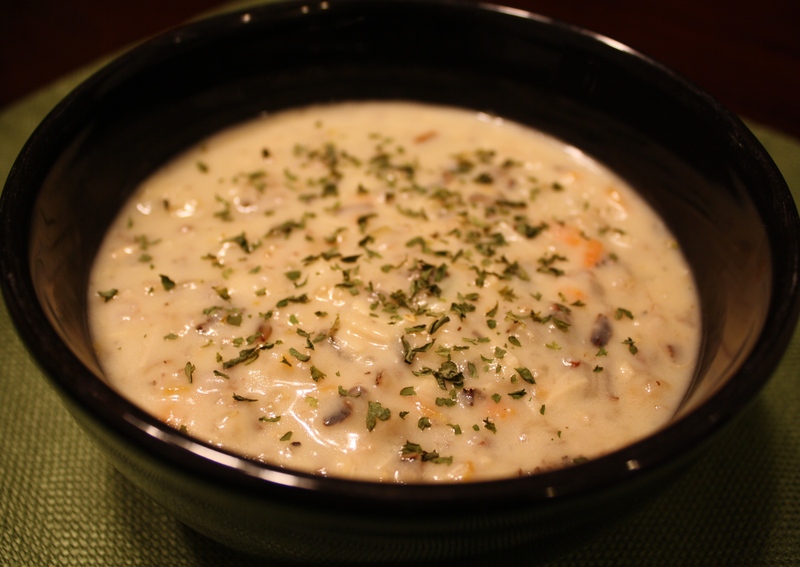 It is so creamy and yummy and just perfect for the cold, rainy Seattle day we had today. It’s a really quick recipe, but the wild rice can take 45 minutes or more so be ready ahead of time for that. I hope you enjoy this recipe as much as we do! Now go get rid of that leftover turkey! Happy Holidays! Let me just preface this blog post by saying that Matt dubbed this his favorite dessert I have ever made him. Ever. It’s that good. So good that I had some for breakfast! Don’t judge me – it’s fruity and bread-like, which is no different than toast with jam on it! And I’m just going to continue to tell myself that! Anyways… there is this really cool store near where we live that has all fresh, yummy stuff (like a mini-Good Food Store for you Missoulians). They are always advertising their amazing, fresh, local peaches on signs by the road, so of course I had to stop. I already planned on making a peach cobbler, that much was for sure! Well… yesterday I was sitting outside on the deck in the back yard and noticed that the blackberry bushes were FULL of big, beautiful blackberries! 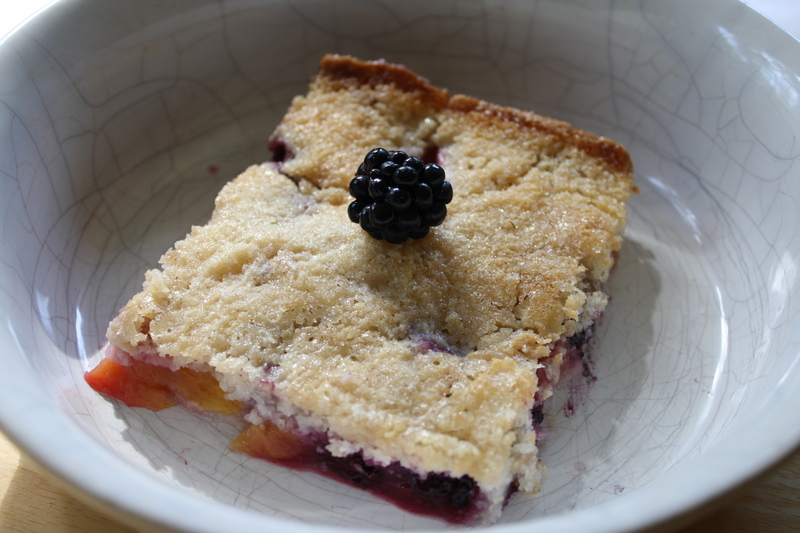 I had heard of peach blackberry cobbler before and decided to give it a whirl. I did some recipe digging and settled on the Pioneer Woman’s Blackberry Cobbler recipe. (This may come as a shock to some of you who know what a food blog lover I am – I didn’t discover the Pioneer Woman’s blog until the beginning of this year! Crazy right?) I didn’t have self-rising flour on hand, so you’ll notice a difference in recipes there. Rinse the blackberries and dry on a paper towel, then peel and pit your peaches and cut into cubes. In a medium bowl, stir together 1 cup of the sugar, flour, baking powder, and salt. Add the milk and combine. Add the melted butter and whisk until smooth. Pour the batter into the greased baking dish. Scatter the top with all of the blackberries and peaches. Sprinkle 1/4 cup of sugar over the top. Bake for about 1 hour or until the edges are crispy. When you have 10 minutes of cooking time left, sprinkle with remaining 2 tablespoons sugar. Serve warm with ice cream – YUM! Just writing this is making me want to go have some cobbler for lunch! I’ll try and control myself… I definitely used more than 1 cup of each fruit – probably more like 1 1/2 cups. This recipe is more of a buckle than a cobbler to me (What’s the difference you ask? A cobbler has more of a biscuit topping with fruit on the bottom – a buckle has the cake on the bottom and then the fruit is put on top like this one and when it’s baked, the fruit sinks to the bottom). Whatever it’s “technical” name is, it is phenomenal! Hello friends! I just got back from a week in Missoula with wonderful family, great friends, and, of course, yummy food! As much as I love to cook, it was nice to have every meal cooked for me! The no cooking streak continued until Sunday, and, after almost a week and a half with no cooking on the brain, I wasn’t feeling too creative. After going through the cupboards, refrigerator, and freezer, I decided on hamburger helper. Wait! Before you judge or think “Food out of a box?! From Des? 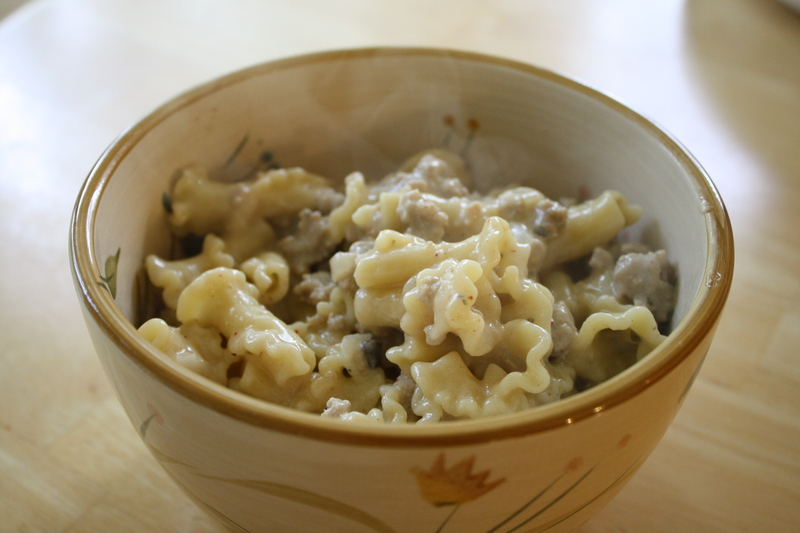 !”, it wasn’t the actual Hamburger Helper – it was my version, which is so easy and so much better! Boil a pan of water and cook the noodles til “al dente”. Brown the burger with the onions until meat is done and onions are translucent. Here is where the “assorted spices” come in: I just kind of grab whatever sounds good to me and sprinkle it in (probably 1/2 tsp or less of each). This time it was Alpine Touch, pepper, onion powder, garlic powder, Johnny’s Seasoning Salt, dry parsley, and chili powder. I definitely used more of the Alpine Touch & Johnny’s than anything else. I know it sounds like a lot of spices, but you can definitely use whatever sounds best to you. Dump in the can of cream of mushroom soup, fill the soup can with milk, and pour that in too. Let this mix cook for about 20 minutes on low heat (while the water is coming to a boil and the noodles are cooking). Add in the 1 cup of sour cream, mix well, and then add in the cooked noodles. Stir this all together and serve! This is another dish I picked up from my mom over the years, except I added the sour cream in to give it a more “stroganoff” taste. She doesn’t like to cook things from a box, and neither do I as we’ve learned from previous posts. Why cook from a box when you can use fresh ingredients and make it exactly how you like it? (Plus it is SO much better!) We both do a similar dish, but with tuna (aka Tuna Helper). So next time you’re at the grocery store and you reach for that boxed helper, STOP! and think of this recipe and how much better you could make it with your own ingredients and imagination! Chicken doesn’t have to be boring!! Put the first 8 ingredients into a large electric skillet. Heat on medium high heat for 10-15 minutes, turning the chicken once halfway through. 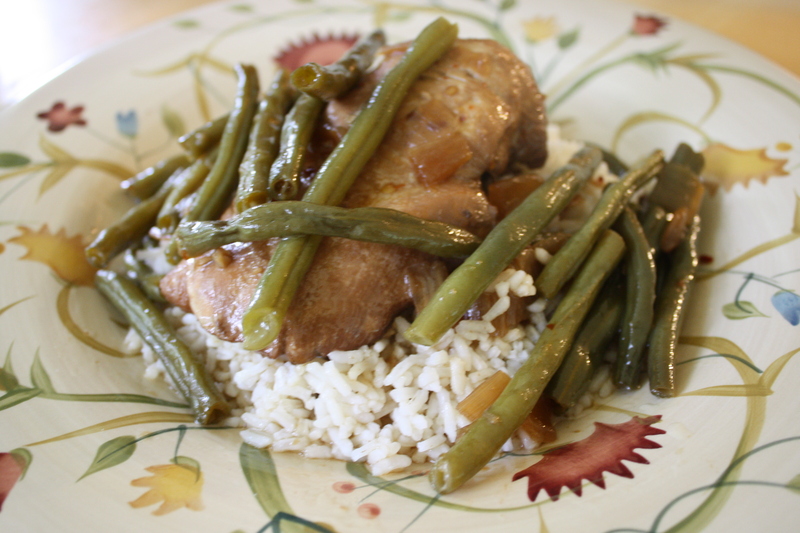 Reduce heat to low, simmering for 2 hours, turning the chicken ever 45 minutes or so. Note: Don’t let the chicken cook too hard or else it will come out VERYYYY salty – you want it at about 200-250 degrees on the skillet setting. Add the green beans about a half hour before serving and increase the temperature to medium low (300 degrees) after 15 minutes. Serve over rice and enjoy!